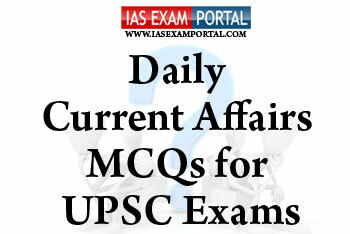 Current Affairs MCQ for UPSC Exams - 6 August 2018 | IAS EXAM PORTAL - India's Largest Community for UPSC Exam Aspirants. 1) JMVP was announced by Government in 2014-15 Budgetfor capacity augmentation of navigation on 1,380-km Haldia-Varanasi stretch of National Waterway-1 (NW1) on Ganga River. 2) The project will be implemented at a cost of over Rs. 5,370 crore rupees with the technical assistance and investment support of the Asian development bank. 3) It also includes the development of fairway, multi-modal terminals, strengthening of open river navigation technique, conservancy works, modern River. Which of the statements are true ? 1) Improving transmission of the policy rate into lending rates of the banks. 2) Bringing in transparency in the method followed by various banks for the determination of interest rates. 3) Ensuring the availability of bank loan at rates that fair to both lenders and borrowers. 1) The initiative aims to advance research in energy, security, and healthcare domains in the high education institutions. 2) IMPRINT is the first of its kind government supported initiative to address the major science and engineering challenges that India must address and champion to enable, empower and embolden the nation for inclusive growth and self-reliance. 3) The initiative will be jointly funded and steered by MHRD and Department of telecommunication . Q5. As a person moves from Jaipur to Chennai which of the following mountain ranges/hills will he pass through in his journey?